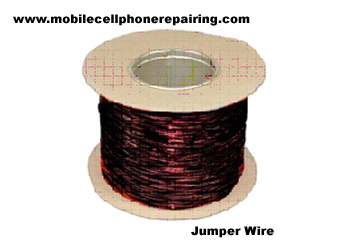 Jumper Wire: This is a thin laminated or coated copper wire used to jumper from one point to another on the track of a mobile phone while repairing. Most people doing the work of mobile repairing do jumper to solve many hardware problems. What is Jumper Wire used For? Jumper wire is used to connect one point of the PCB track with another point. This is generally done when some electronic components or ICs is faulty and is not easily available in the market. Jumper wire is available in different diameters such. It is basically a thin copper wire with laminate. The laminate on the wire prevents any shorting. This laminate cover is removed at both the ends while doing jumper.